The Lefferts Manor Association is planning our annual holiday wreath project for Saturday, December 8th. 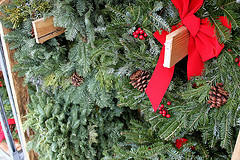 Households who are paid members for 2012 will receive a fresh fir wreath adorned with a bright red bow. Please gather at the driveway of 77 Midwood Street from 10 to 12 on the 8th to help tie bows on the wreaths. Board members are also organizing volunteers on each block to help deliver the wreaths on their blocks.There are lots of ways to help and make our neighborhood look even more beautiful for the winter holidays. Contact us at LeffertsSupport@gmail.com if you have questions. If you haven’t paid your 2012 dues. Use this membership form.